The stakes could not be higher for the junior U.S. senator from Texas as the March 1 primaries approach. Long a day on which his campaign hoped to make major progress, Super Tuesday is instead shaping up to be a potential do-or-die moment. HOUSTON — Barely one-tenth of the vote was counted in the Nevada caucuses Tuesday night before Ted Cruz's supporters were setting their sights on another part of the country. Glenn Beck, a Cruz surrogate not known for restraint, bounded onto the stage at Cruz's election night party in Las Vegas and repeated what, by his account, he had been saying all along. "I'm totally fine with him being in third place," Beck said of Cruz's Silver State showing, "because Super Tuesday is coming. Texas is coming." Super Tuesday is indeed coming — and the stakes could not be higher for the junior U.S. senator from Texas. Long a day on which his campaign hoped to make major progress toward securing the GOP presidential nomination, March 1 is instead shaping up to be something much different: a potential do-or-die moment. After three straight third-place finishes in other states, Cruz now looks toward Super Tuesday to rescue his argument that he, not U.S. Sen. Marco Rubio of Florida, is the best candidate to go head to head with billionaire Donald Trump. Since the Nevada caucuses, Cruz has done little to tamp down already high expectations for his performance as voters in 12 states divvy up the biggest pile of party convention delegates to date. Cruz routinely eschews calling any state, including Texas, a must win, but that has not stopped him from speaking of March 1 in his most bullish terms yet. "Super Tuesday, I believe, will be the single most important day of this entire presidential election," Cruz said Wednesday at a Houston rally where he received the endorsement of Gov. Greg Abbott. "I believe we are poised to have a very good night." Speaking with reporters after the rally, Cruz fielded the kind of question that would have been unthinkable as recently as three weeks ago: What happens if you do not do well? He insisted the "terrain is very favorable" and that his campaign is "now teed up to where exactly we intended to be on Super Tuesday." Pressed about his path forward if he does poorly, a somewhat frustrated Cruz ultimately turned the question on the media. "I'm curious how many reporters ask Marco Rubio after losing four states in a row, 'So when do you drop out when you haven't won a state?'" Cruz asked. 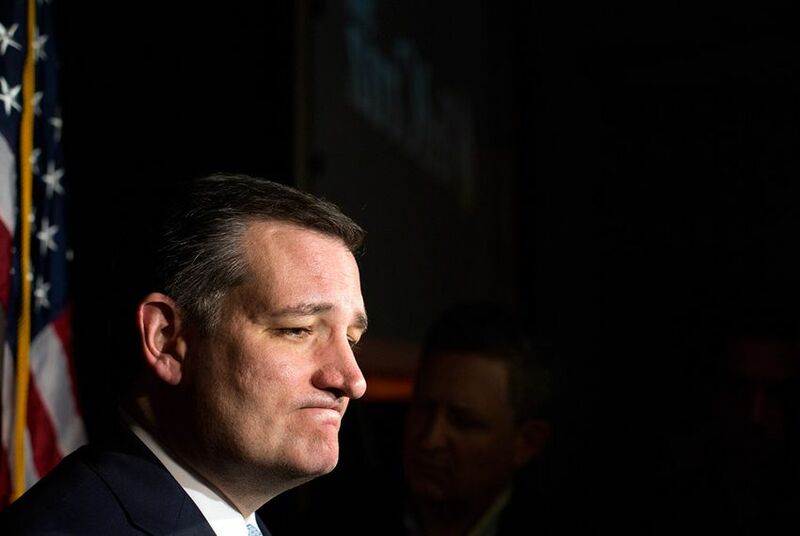 Cruz needs a "positive turn," said Bob Vander Plaats, a national co-chair of Cruz's campaign. Vander Plaats, an evangelical leader from Iowa whose endorsement helped lift Cruz to victory there, said that turn could come as soon as Thursday night at the 10th Republican debate at the University of Houston. As for Cruz's objective on Super Tuesday, Vander Plaats said "what he really needs to effectively do is put a pause on the Trump momentum and reset the campaign going into March 15." Vander Plaats is not the only prominent Cruz backer to voice such concerns: A number of them have gone public in recent days, arguing Cruz is letting Trump run away with the nomination by focusing some of his energy on Rubio. To a degree, Cruz's campaign views Super Tuesday more through the prism of its battle with the Florida senator than with the New York billionaire. The thinking is that if Cruz can put more points on the board than Rubio does Tuesday, he can strengthen his case that his Senate colleague is incapable of notching wins against the billionaire. “It’s going to be Texas plus a lot of big second-place finishes, and Rubio won’t win anything," predicted a person close to the Cruz campaign. Cruz's current situation is a far cry from six months ago, when he proclaimed the Super Tuesday states his "firewall," undertaking a seven-day, seven-state bus tour of the region. He returned to the territory in December as part of a weeklong, 12-city fly-around tour, further ratcheting up expectations in parts of the country that his foes have approached with less fanfare. The pressure seemed to reach a new level Wednesday, when some of Cruz's highest-profile supporters scrambled to deny a report that they were preparing to bail on him if he did not do well on Super Tuesday. Among them was Family Research Council President Tony Perkins, who issued a statement saying "there is not a snowball's chance that I'm changing my endorsement." Cruz's Republican rivals have been happy to stoke the tension. Rubio's campaign moved quickly Thursday night to share with reporters the news that Cruz had pulled out of an event Saturday in one of the SEC primary states, Alabama. "The 'southern firewall' Ted Cruz’s presidential campaign has been building for months appears to be crumbling under the weight of Donald Trump’s staying power and Marco Rubio’s resurgence," read a story on the website of the host of the event, Yellowhammer Media. Cruz's schedule leading up to Tuesday offers some hints of where he sees his best chances of winning: He is spending the most time in Oklahoma, with three events there Sunday, and Texas, with three events there Monday and his election night party in the Houston area. The itinerary neither includes Alabama nor some of the non-southern states voting Tuesday, including Colorado, Massachusetts and Virginia. In the South, Cruz allies do not deny Trump has the wind at his back. Yet they are holding out hope that Cruz will come out on top as a result of the early attention he paid to their states and the superior organizations he has since built there. Asked if Cruz still has a path to the nomination if he does not do well Tuesday, Arkansas state Rep. Bob Ballinger was less than unequivocal. "I couldn't describe exactly what that path looks like, but I think there's a chance we get a brokered convention anyway," said Ballinger, who co-chairs Cruz's campaign in Arkansas. "And if that's the case, anything's possible."